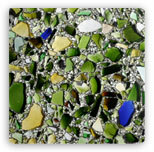 Vetrazzo Countertops are the newest rage in Green Design. 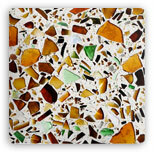 It is a product made from recycled glass bottles, windshields, glass windows and also decommisioned traffic lights! 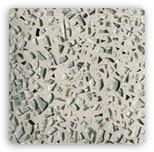 This product is very durable and easy to maintain. 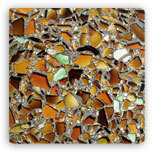 Many compare it’s strength to granite, as well as it’s scratch and heat resistance.Â 85% of the surface is glass which cannot stain, however certain types of liquids like red wine, lemon juice or vinegar may etch away the surface if not cleaned promptly.Â Other types of countertops such as butcher block or marble have an aged look over time, but Vetrazzo will not age and will stay beautiful and new forever if taken proper care. Vetrazzo cleans up with simple soap and water since it is mostly glass. 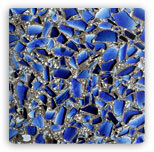 Vetrazzo countertops are the new trend in the design world today. If you would like more information Style on a Shoestring would be more than happy to provide that for you.